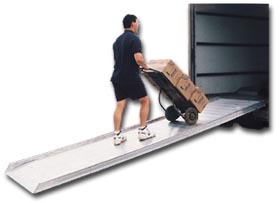 Ideal for loading or unloading trucks when a dock is not available. Durable, yet lightweight, these ramps are perfect for use with 2 or 4 wheel carts. Safety chains are provided to connect the ramp to the truck. Grooved plates provide excellent traction. FOB Shipping Point. Style A-- Rests on the truck bed. Style B-- Steel hooks mount to exterior of truck. Cap. (lbs.) Wt. (lbs.) Price Ea.